The best way to get to know a community is by scheduling a tour. See the facilities, meet the staff and residents, and get a feel first hand what it's like to live at The Delaney at Parkway Lakes Assisted Living. The Delaney at Parkway Lakes offers seniors a modern aesthetic that’s nothing like a traditional retirement community. 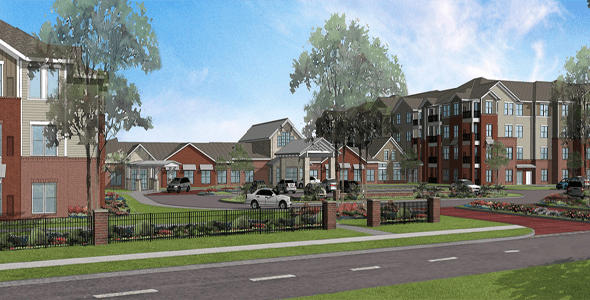 In addition to maintenance-free independent living apartment residences, Hamlets at The Delaney will offer a Supportive Lifestyle for assistance with daily living and an Enhanced Lifestyle with dedicated memory care. Three lifestyles. One perfect for you—or someone you love. The Delaney at Parkway Lakes is the choice in the Cinco Ranch/Katy area for retirees seeking complete freedom to be as independent as they want to be in a casual atmosphere that feels like a well-appointed home. Just minutes from the Westpark Tollway and the Grand Parkway, The Delaney at Parkway Lakes is located near the intersection of Bellaire Boulevard and South Peek Road in the Parkway Lakes development immediately adjacent to Cinco Ranch and Katy, Texas. Parkway Lakes is a master-planned development designed by Hermes that will bring an upscale combination of retailers, restaurants, professional buildings, luxury apartments, and medical facilities to west Houston. For your health and well-being, the community is convenient to the newly opened multi-specialty care center, Kelsey-Seybold Clinic – Katy. In addition, Memorial Hermann Katy Hospital is only five minutes away via Grand Parkway at I-10/Katy Freeway. Residents of The Delaney at Parkway Lakes can enjoy access to the arts with the Katy Contemporary Arts Museum and Katy Visual and Performing Arts Center. Other cultural and educational attractions include the Fort Bend County Museum, George Ranch Historical Park, and historic downtown Katy.